We work individually with each client to design and craft truly singular bedroom furniture. All custom beds and bedroom furniture can be built to your specific needs and preferences; sensitive to how you live, what you need to store, and personal style. We begin by listening carefully to your concerns and needs, in order to gain an understanding of what needs to grow out of our collaboration. We create a design concept that merges your vision with our expertise, to create solutions that are truly optimal for your space. With all our bedroom projects, our aim is to create a space that is a pleasure to retreat to. Like all our woodwork, we build your bedroom furniture to the highest standards of craftsmanship. All our pieces are handmade by expert craftsmen in our Brooklyn studio. The end result is a bedroom that is designed to meet your needs long after we have left. This walnut bed features a headboard and built-in nightstands, with wires tucked away behind built-in metal grommets. Stanley (the cat) approves. This was for the master bedroom of Apartment Therapy's founder and CEO, Maxwell Ryan. We took one look at his funky closets (they were wasting space and closing in on the room), and suggested that he remove them and let us build him something on the opposite wall that would make more sense. As he described it, "That's when the fun began." Most closets have a lot of wasted space, with spots that require you to contort yourself to reach things. We wanted to build something that would give him full access to everything. So we ripped out his closets, which were on the opposite wall from where you see the cabinets now. This would also really open up the room. The cabinet would cover the entire far wall. We worked closely on the design together; he wanted something simple and perfectly symmetrical; it was important that it be calm in appearance, to not clutter up the room. The space above the cabinet was previously open to the rest of the apartment. We installed a long plexiglass window that would cut off noise, but still let light through. The unit had long term storage space up high for suitcases, and drawers on both sides for clothing and linens. The icing on the cake was a cozy inviting nook with a hanging lamp, bench and cushions; the focal point of the piece. Below the nook were custom drawers for shoes. More details of this bedroom renovation are covered in Apartment Therapy, including photos from before the renovation. This apartment was also featured in New York Magazine. This project was for a client with a captain's bed that had been falling apart. All the drawers had become skewed, because it had never been properly leveled (and the floors of this brownstone were severely sloped). We decided to start from scratch, and build a bed with drawers that would operate smoothly for the long haul, as well as storage around the wall bump in the bedroom. Since the wall bump was narrower than the width of a queen size bed, we decided on a storage column that would be flush with the wall bump, and continuous with the bed; this made use of space that would have otherwise been empty. The bed required shimming so that the drawers would always operate quietly. Everything was made of bamboo with exposed edging and natural finish. This captain's bed features shelving for books, and drawers that open from both sides, with no visible pulls (handles or knobs). The drawers open with touch latches. This bed also has hidden storage at the head to make use of the space that would have been inaccessible by side drawers because of the bedside tables. We also made the matching built-ins for this apartment. 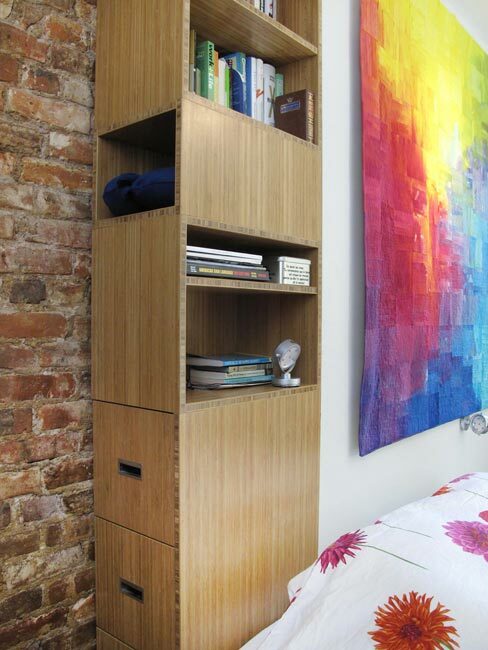 There was limited space in this bedroom, so we integrated a bedside table into the design of this wardrobe. It had a notched corner to fit over the heating unit, and plenty of shallow drawers for jewelry and cosmetics, as well as hooks for necklaces. This unusual space was an alcove on the way to the backyard of the apartment, with a tiny secondary alcove (where the bedside table now is). We were not sure what the space was originally intended for, but it was the perfect place to fit a queen bed with a built-in attached bed-side table. Both pieces were made of walnut.